To find the Devil's Tail, ride to Historic Baker City, Oregon then travel east on Hwy 86 along the Hells Canyon Scenic Byway to Richland, Halfway, and finally to Oxbow, Oregon - The Devils Tail starting point. Take the Devil's Tail (also known as National Forest Service Rd #454) from Oxbow, Oregon across the Snake river into Idaho, all the way to Hells Canyon Dam and the Hells Canyon Visitors Center. It's got hundreds of curves, spectacular views, and can be very dangerous if you are not paying attention. Riders from all over the world come to Hells Canyon to ride this famous motorcycle road. Located in Hells Canyon, this is the deepest motorcycle road in North America. 2000' deeper than the Grand Canyon. The road gets it's name from the fact that it forms the base of the Seven Devils Mountains and the eastern wall of Hells Canyon. The scenery is out of this world. Makes Deal's Gap look like child's play. Bring your camera and enjoy a special ride only a experienced by a few. There is a blog you can read about it: http://devilstailfaq.blogspot.com/ see you there, ride safe. The Devil's Tail can be challenging, the road surface has tar snakes and rock falls. Hundreds of curves with posted speeds of 10 to 35 mph. Elevation rises from river water level at the Snake River until you reach a high cliff, then back to river level at the dam. .
Get gas at Scotty's Hells Canyon Supply. There is no fuel for 44 miles round trip. 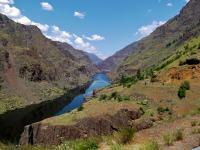 Hells Canyon Visitor Center is just after you ride over Hells Canyon Dam. The visitor center has a pop machine and washrooms. There is also a jet boat launch ramp there, it's fun to watch! on June 19, 2012 5 out of 5 members found this review useful. We are here on vacation and on our list is to see the Hell's Canyon. The best part of this is the ride is better than the canyon itself. What a blast. Just to be clear the road is paved all the way to the Interpretive Center at the damn. Another great ride to add to your day is to take the road toward Joseph and the Hells' Canyon Overlook. Again a good paved road. You can get fuel at Scotty's for both your stomach and the bike. The people are so nice. Lastly. Watch for deer!!! 5 seconds faster and I would have hit one. on March 23, 2011 3 out of 3 members found this review useful. Great road for bikers. A quick stop at Scotty's and you can find out about the LEO situation in the canyon, then have all the fun you want. Stop for the view, keep your eye on the road when riding. it's an awesome experience. A top 10 road for me. on March 22, 2011 3 out of 3 members found this review useful. This is one of those scenic roads with breathtaking vistas. You need to remember to pull over at the view points and drink in the beautiful landscape. The technical nature of this road demands your full focus and attention at every twist and turn. on June 3, 2014 1 out of 1 members found this review useful. No one has mentioned Camp Fruit, that's what I call it. A great free camp spot in an abandoned orchard at N45.13068 W116.73895 . In late summer and early fall there are plums, cherries, and other yummy fruit. on July 25, 2012 1 out of 3 members found this review useful. This road is NOT 22 miles long. It takes more than 68 miles, from I-84, to get to Hell's Canyon Damn. The last 22 of which are what I believe they are refering to as The Devil's Tail. Was the road awesome? Yes, but having to be to work that evening, it certainly put a damper on my ride..turning it from a relaxing ride, into a rushed, I need to get back for work, ride. on April 29, 2011 1 out of 2 members found this review useful. The most fun you can have ,with your clothes on. on March 25, 2011 1 out of 1 members found this review useful. This road is more fun than a day at Disneyland. on March 21, 2011 1 out of 1 members found this review useful. Truly spectacular! One of the best motorcycle roads in the world. on July 24, 2014 0 out of 0 members found this review useful. We camped in Joseph OR and rode over to Oxbow on NF-39. That road is approximately 54 miles long and takes approximately 2 1/2 hours due to all the corners. The road has gravel in patches on the last 13 miles or so on the Oxbow side and occasional gravel in the corners so be careful. Every gravel patch had breaking bumps on them. Going back the other way, I almost went down when my front and back tire decided to use different sides of the rut I was trying to avoid. Thank god for a little luck and my training feet lol. We ran that road twice in the same day and it was the shorter alternative to going around through Baker back to Joseph. As for Scotty's, it was a life saver in the 102 degree heat and Diane(?) was already filling up 32oz cups of ice water for us. She was a character. The tail itself had lots of tar snakes/patches so be careful when its hot. As for gas, Scotty's does not have gas anymore so if you don't have at least 100 miles in your tank, turn around and go to Halfway and top off. There is only one station in Halfway that has premium. Its a co op when you come into town, turn left and its about a quarter mile down. All in all it was a great experience, but, I do not see myself going back. Another check on the bucket list. on December 26, 2013 0 out of 0 members found this review useful. We stayed in Cambridge and came into the canyon via highway 71. 71 is a great road in itself and Cambridge is a neat little town but with limited accommodation so beware or book ahead if you are wanting to overnight. The canyon road was scenic no doubt but I found it's poor surface and off camber corners to require constant attention which took away from the ride. Views are spectacular of course but you must choose your stopping points for photos carefully as the road is narrow. At then end of the day my riding partner agreed it was nice but we had more fun on the way in and out on 71 than on the canyon road itself. on May 31, 2012 0 out of 0 members found this review useful.